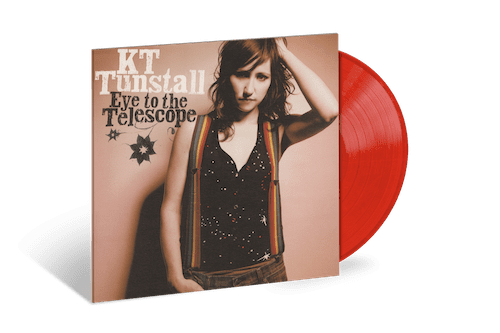 06 February 2019 (Toronto, ON) – On March 1, Universal Music Canada is reissuing KT Tunstall’s debut album, Eye To The Telescope, for the first time since its original release in 2004 . The album, pressed on striking transparent red vinyl, features hit singles “Black Horse and the Cherry Tree”, “Other Side Of The World” and “Suddenly I See”. The special edition vinyl and digital download card are available for pre-order now HERE. KT Tunstall has remained at the forefront of UK singer-songwriter talent since releasing Eye To The Telescope. The album went 5x Platinum in the UK and has sold over 5 million copies worldwide. Following the immense success of her debut, KT outsold every other female artist in the UK in 2005, won the 2006 Brit Award for Best British Female Solo Artist, won the Ivor Novello Best Song award for her huge, self-penned hit “Suddenly I See”, and a Q award for Track of the Year. She also landed a GRAMMY nomination for Best Female Pop Vocal Performance and lent her tunes to a host of movies (including The Devil Wears Prada), TV shows, and Hillary Clinton’s 2008 campaign theme song. Over the next decade, three further critically acclaimed albums followed; Drastic Fantastic, Tiger Suit and Invisible Empire//Crescent Moon in 2007, 2010 and 2013 respectively, keeping the Platinum sales rolling and cementing the Scottish singer-songwriter’s reputation as a major recording talent, as well as a mesmerising live artist. KT’s latest body of work is a trilogy of albums following the themes of soul, body and mind. Released in 2016, the first album, KIN, covers the theme of the soul and received rave reviews. The second album in the trilogy, WAX, was released in October 2018 and focuses on the body and our complex relationship with physicality. WAX was featured on Spotify’s New Music Friday playlist in a dozen countries worldwide, receiving critical acclaim from both national publications and specialist music outlets in both the UK and USA. Recently, KT has been awarded the Inspirational Artist gong at the Women In Music Awards. She was chosen as the first ever female Grand Marshal (following the likes of Sir Sean Connery) to lead April’s annual New York Tartan Week parade. In May 2018, she and Mike McCready, of legendary multimillion-selling band Pearl Jam, also released a cover of Tom Petty’s huge hit single, “I Won’t Back Down” with proceeds going to Pearl Jam’s Vitalogy Foundation.